Quintel, Inc., located in Schererville, Indiana, specializes in the reconditioning, repair, and remanufacture of heat exchangers from original specs and the reselling of OEM heat exchangers. The key founder, Dave Lindlow, a machinist by trade with many years of experience servicing heat exchangers, and his wife, Peg, started Quintel, Inc. in 1994. Today, the company is managed by Dave and his two sons, Rick and Steve. The three are hands-on managers working with the customers and performing everyday shop functions. As an ASME code shop with an “R” stamp and Quality Assurance Program, Quintel offers services to suit each customer in quality, service, and price. In 2012, we expanded our shop to serve our customers more efficiently. We installed a 15 ton crane and equipped the new facility with the latest tools and the most modern, sensitive testing equipment. We are fully operational for pre-service diagnostics, post-service testing and inspection before a job leaves the shop, and if the need arises, we have the manpower and know-how to perform heat exchanger reconditioning, repair and installation on-site. 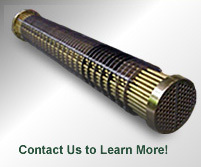 We are also an OEM reseller of several major original equipment heat exchanger manufacturers. We have also implemented the use of a modern ultrasound cleaning system. This technology allows for the most efficient removal of particulates and film-like contamination but is also extremely gentle on the materials to be cleaned. This method is extremely effective by using ultrasonic waves to develop a full, and safe, cleaning process. Quintel services locations all across the US and we have the requisite transportation equipment to move a heat exchanger from your facility anywhere in the continental US to our shop in Schererville, Indiana, and back. The Quintel customer base is diverse servicing industries such as refineries, chemical and food plants, steel mills, manufacturers, and Power Generation. Quintel, Inc. continues to attract new heat exchanger business and add new customers, often through referrals, because of our fair prices, better turn-around time than from OEM heat exchanger manufacturers, ongoing commitment to quality, and guaranteed one year warranty on all work performed. With over 25 years of experience in the heat exchanger industry, our customers have been given positive results, quality service, attention to detail, and a worry-free experience. We may not be able to say we’re a Six Sigma Company, but we can say we operate as one! 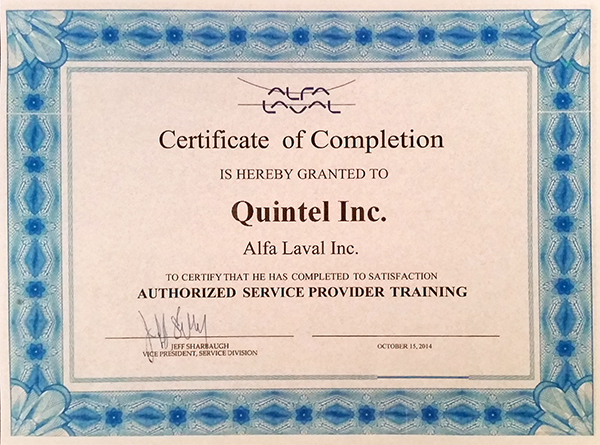 Quintel, Inc. is a registered member of ‘ISNetworld’.